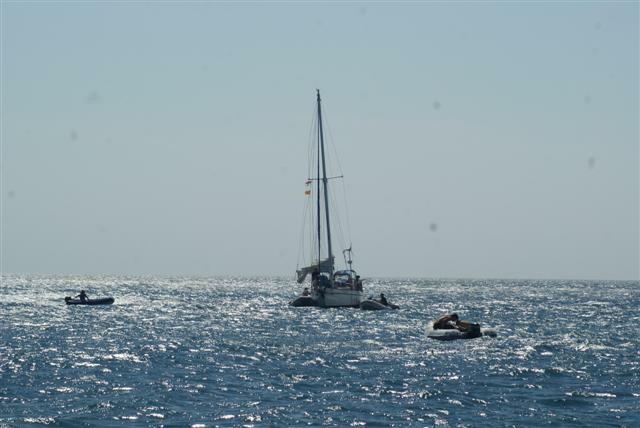 Our 4th day at sea had seen some wind and we sailed with the twizzle rig up all day. 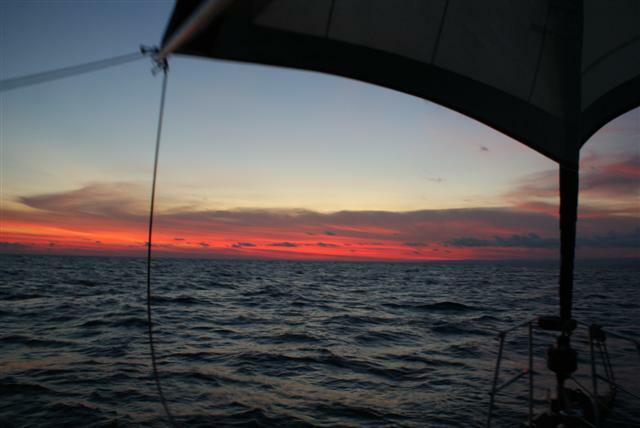 Now we had a dilemma because as the passage had been slow our predicted time of arrival was going to be after dark. 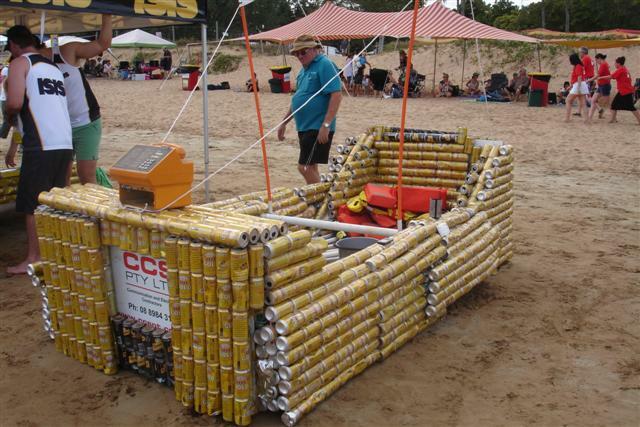 We could motor, but probably still wouldn’t get there in time, or we could slow the boat down. We opted for the latter. I hate doing that, it seemed crazy to slow ourselves down but the approach to Kupang is through a fairly narrow channel and travelling through after dark would be difficult. We were 20 miles from the entrance at 22.00 with 5 other boats around us. After communicating on the vhf radio we all decided to hove-to for the night. 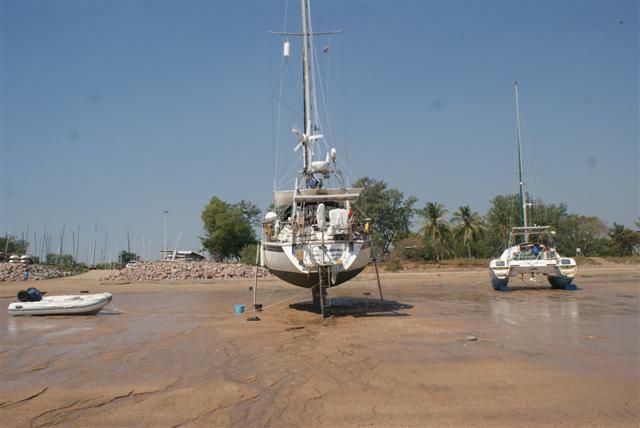 We didn’t have the main up so we just winced the gennies in and let the boat drift. We were still travelling at 1½ kts towards the entrance. Bill had 4 hours sleep then let a bit more sail out. At 6am we proceeded into the channel. There were lots of fishing boats on their way back in with their catch plus lobster pot buoys everywhere so I think we had made a wise decision. 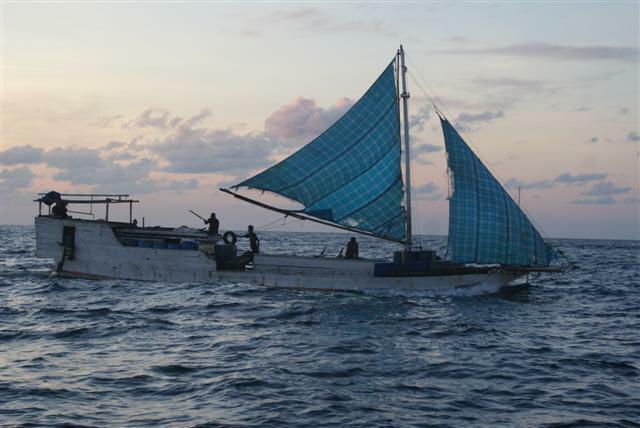 Our first sight of Indonesians was in a fishing boat coming towards us on its way out of the channel to go fishing. It looked very rickety with a tatty sail; I don’t think I would have liked to sail in it. 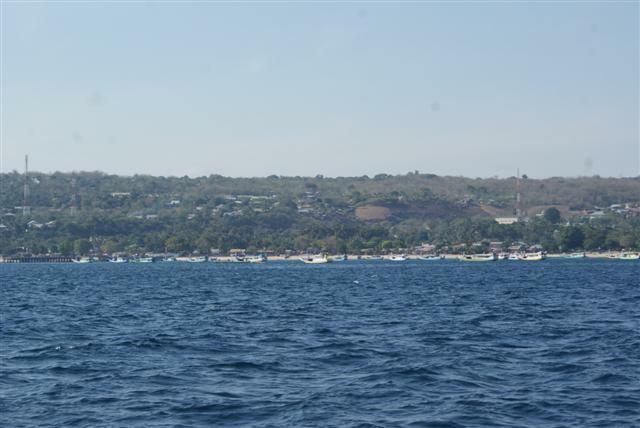 This is the local fishing fleet a little way away from Kupang. 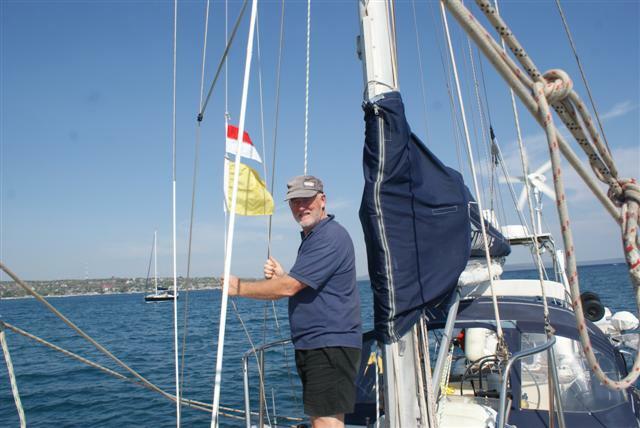 When we arrived Bill hoisted our Indonesian courtesy flag along with our yellow ‘Q’ flag to await the customs. During the day the last of the fleet arrived, mostly under their own steam. 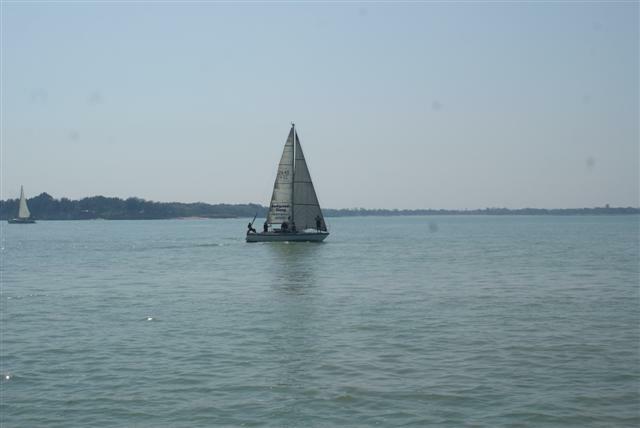 This boat’s engine had broken down on the third day and they had sailed with whatever wind they could find. 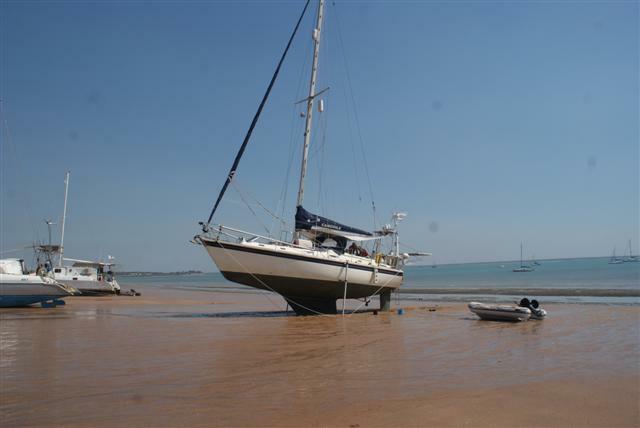 When they arrived at the anchorage I put a call out on the net to ask for dinghies to help tow them in the last bit. The camaraderie of the rally is starting to show. So far we are having a wonderfully boring but SAFE passage out here, long may it last. Sunday we had a light south easterly wind blowing so we managed to get the twizzle up and either sail or motor sail most of the day. At about 18.30 the wind veered to the south so we put the twizzle away and hoisted the main and a single genny and sailed most of Monday. Last night was a bit concerning because the boats ahead of us (this is when it pays not to be in the lead) were reporting groups of fishing nets with strobes on them. We have been warned about Indonesian fishing nets but we weren’t expecting them yet. I think it was because we passed the Dillon shoals last night where the sea bed goes from 500 meters to 13 meters, at it’s shallowest point, and it’s probably good fishing ground. The wind died over night and we’re motoring again. 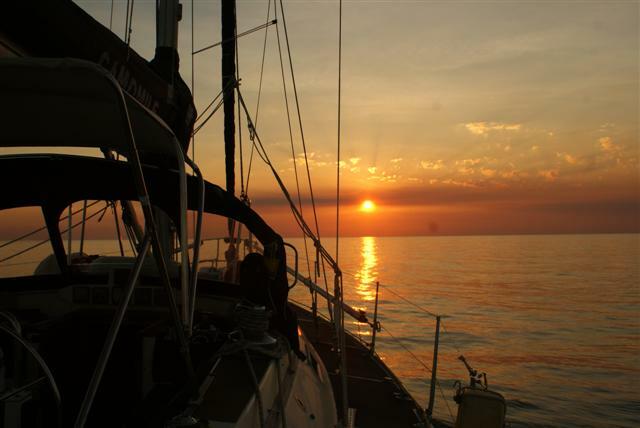 I’ve got about 50 yachts reporting into my SSB radio net in the morning and all is well although this morning one boat reported loss of power in their engine and will have to sail the rest of the way, which will be difficult without any wind. When they get nearer one of us can take them in tow. PS STILL no fish! Now have 2 lines out 24 hours. Our first day at sea has been mostly motoring without any wind. Last night the wind came up for about 4 hours then died but this morning it’s back again and we are sailing with the twizzle out. The wind is still very light so I don’t know how long it will last. We weren’t sad to leave Australia, it was very expensive with a high cost of living and a bad exchange rate for our , but we were sad to leave our Aussie friends. 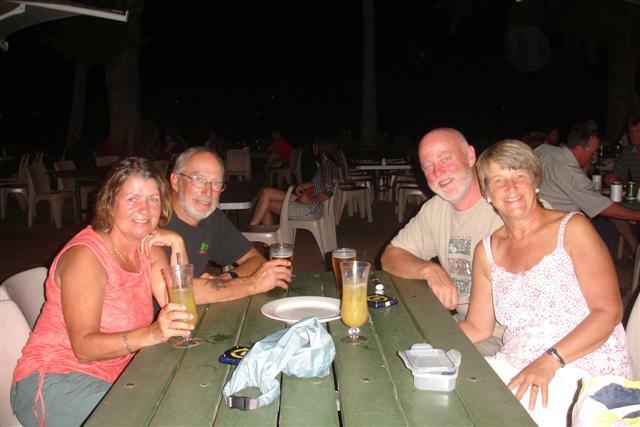 We were made to feel welcome by our past cruising friends and cousin John and Helen. Also we said goodbye to Kennedy on Far Star, a single hander from Alabama, USA. Kennedy is always very friendly and would help any one but he wants to get back home to see his grand children so he leaves for South Africa in a few days. So long Buddy. It’s strange traveling with so many boats around us. 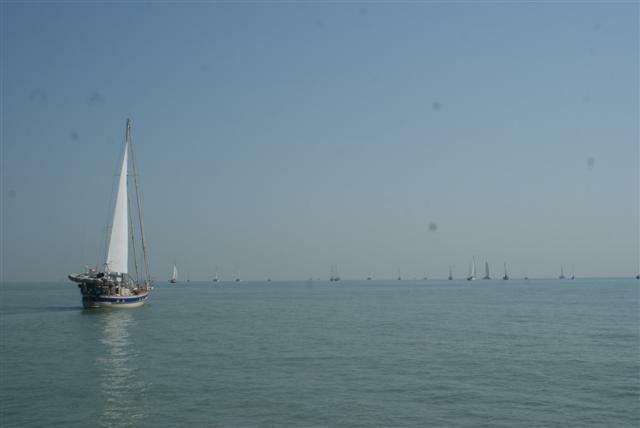 50 yachts crossed the start line yesterday with another dozen or so following on in the next week or so after they’ve sorted out various problems. There’s another 20 or so who have gone north to Saumlaki and we join together half way through the rally. We are roughly in the middle of the field according to my net that I’m running in the mornings. It’s quite difficult taking the positions of that many boats but we don’t do weather and I’m very strict with everyone!! The weather is the same right across the Timor sea. Our first stop is Kupang in West Timor (and in case you thing there’s fighting going on there, the fighting stopped 10 years or so ago). 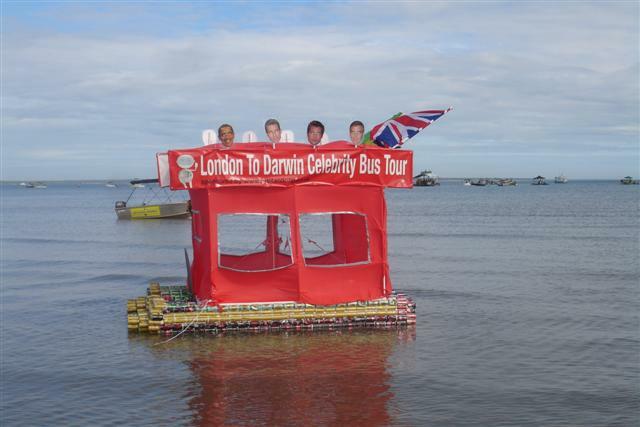 It should take us 3 1/2 to 4 days to cross; a bit like a Biscay crossing so it’s not too far. Sleep is always difficult the first couple of days with the watch system but eventually I’m so tired I fall asleep as soon as my head hits the pillow at the end of my watch. We leave Australia in an hour for Kupang in Indonesia, really really excited! Should take 3 or 4 days although at the moment there isn’t any wind. We have a start time of 11.00 but with over 70 boats starting together we may hang back. Inspiration Lady just in front of us with all the rally boats up ahead. 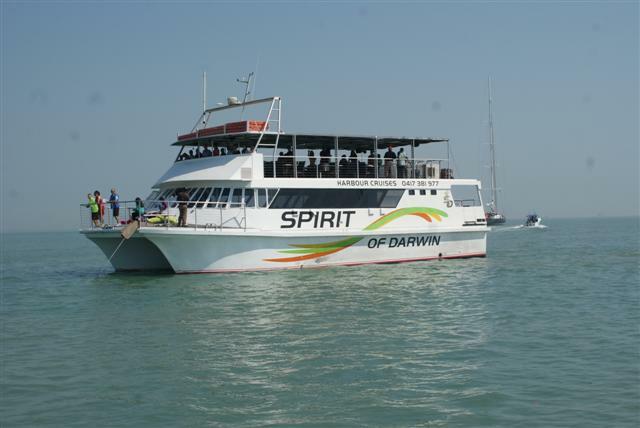 Darwin doesn’t have the same environmental issues that Queensland had and many of the rally boats have been landing on the beach to have their hull scrubbed. We decided to get Camomile’s ‘legs’ out and join them. We landed on the beach at 9am this morning and by 10.30 most of the hull was exposed so Bill and Norman could start scrubbing. I made a quick exit to the town to pick up my passport with it’s Indonesian visa stamped in it. Luckily when I returned it was all finished! Bill has finally managed to get the website back on line. Sorry it’s been down so long. Lots been happening. 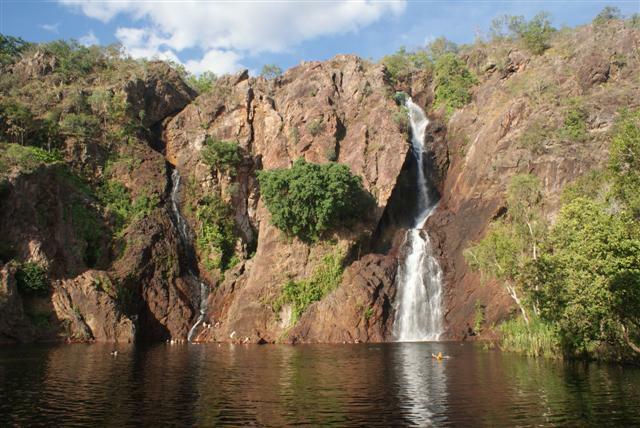 We made it safely to Darwin for Bill’s birthday but the next day we had bad news from home that my Mum was very ill. I decided to fly back to the UK to see her even though she might not have been there. Fortunately she started getting better when I got there. Sadly I couldn’t stay long because we are due to leave on Sail Indonesia on 27th July. We will be in Indonesia for 3 months before we move onto Malaysia when we plan to come home for a couple of months for Christmas. 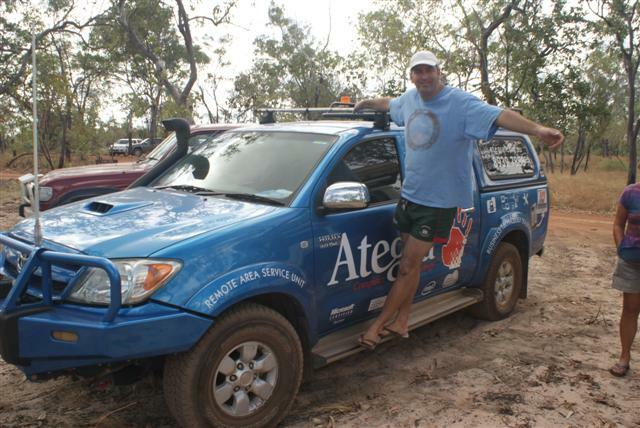 Before I went away we went to watch the Darwin Beer can rally. 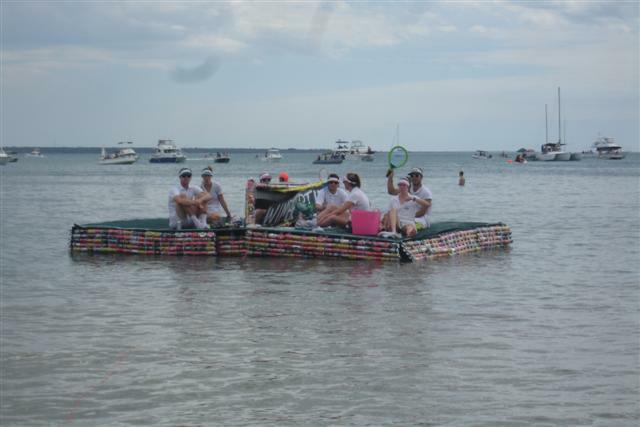 All the rafts were made of beer cans and most of them floated. It was a fun day out with lots of activities going on all day. 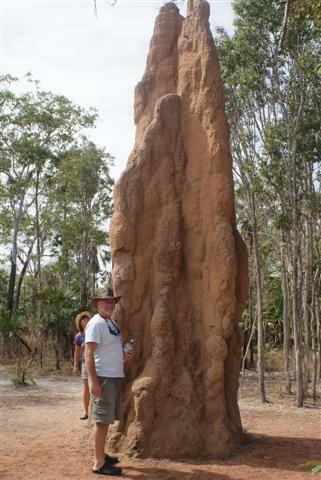 While I was away Bill went a trip with Norman and Sara and our BWR friend Tom to the Litchfield national park where they saw huge termite mounds, saw beautiful waterfalls and sat in lovely crystal clear water.